“We don’t have many real benchmarks for the thermal history of our planet,” says Peter Olson, a geophysicist at Johns Hopkins University who was not involved in the new study. “We know the interior was hotter than today, because all planets lose heat. But we don’t know what the average temperature was a billion years ago, compared with today.” Pinning down when iron in the inner core began to crystallize could offer a window into how hot the interior of the planet was at the time, Olson says. The planet’s iron-nickel core is made up of two layers: a solid inner core and a molten outer core. When that solid inner core formed is a long-standing mystery (SN: 9/19/15, p. 18). “Proposed ages have been anywhere from 500 million years ago to older than 2.5 billion years,” says coauthor John Tarduno, a geophysicist at the University of Rochester in New York. The interplay of the two layers drives the geodynamo, the circulation of iron-rich fluid that powers the magnetic field. That field, surrounding the planet, protects Earth from being battered by the solar wind, a constant flow of charged particles ejected by the sun. As the inner core cools and crystallizes, the composition of the remaining fluid changes; more buoyant liquid rises like a plume while the cooling crystals sink. That self-sustaining, density-driven circulation generates a strong magnetic field with two opposing poles, north and south, or polarity. Traces of magnetism in ancient rocks suggest that Earth had a magnetic field as far back as 4.2 billion years ago. That earlier field was likely generated by heat within the planet driving circulation within the molten core. But over time, computer simulations suggest, the heat-driven circulation wouldn’t have been strong enough alone to continue to power a strong magnetic field. Instead, the field began to shut down, signaled in the rock record by weakening intensities and rapid polarity reversals over millions of years. And then, at some point, Earth’s inner core began to crystallize, jump-starting the geodynamo and generating a new, strong magnetic field. Heat driving convection within Earth’s hot, molten core (orange) powered the planet’s magnetic field for billions of years. New evidence suggests that by about 565 million years ago, that field was weak and increasingly unstable (left). Sometime after that, the inner core began to solidify (red, at right), which stabilized and strengthened the field, giving it relatively consistent magnetic north and south poles (right). 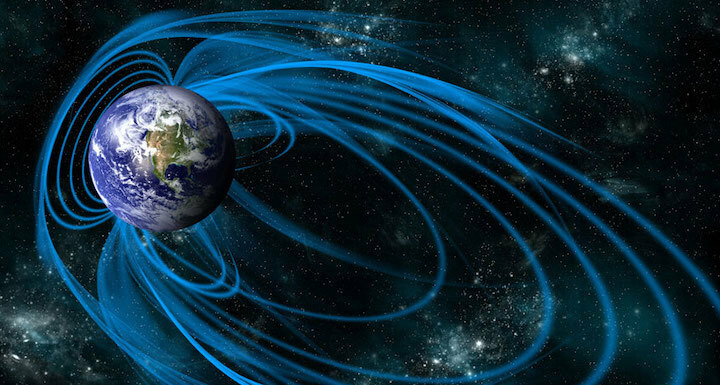 Now scientists think they’ve found evidence of when that magnetic field breakdown was happening. Researchers led by geophysicist Richard Bono, now at the University of Liverpool in England, examined magnetic inclusions within a suite of rocks in Quebec, Canada, dating to about 565 million years ago. Analyses of the inclusions — needlelike iron-rich grains that align themselves with the orientation of the magnetic field that existed when the rocks formed — show that the planet’s magnetic field was extremely weak at that time, the researchers report. Combined with previous studies that have found that the magnetic field was also rapidly reversing polarity during that time period, the new result indicates that Earth’s field may have been on the point of collapse about 565 million years ago. That suggests that the inner core hadn’t yet solidified. Fortunately for life on Earth, it eventually did. The new finding is “potentially very important,” Olson says. Because the rocks bearing the magnetic grains didn’t cool instantaneously but over a long time, the data represent an average field intensity for about a 100,000-year period. That means the scientists haven’t just captured a snapshot in time of a fluctuating field, but have found a true, persistent signal, he says. Computer simulations have suggested that the weak field phase may have lasted much longer, from about 900 million to 600 million years ago. More paleo-intensity data from within that time span, as well as from other locations, would help to confirm that the observed weak phase really signaled the final throes of that pre–inner core field.